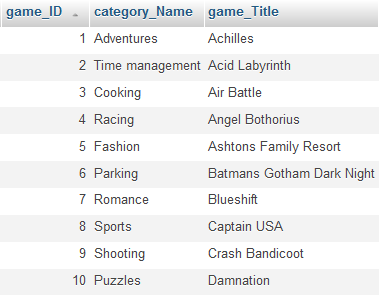 We can make our table like tables in mysql database. We can sorting values in column by clicking filed name. It can be done by PHP. 2. 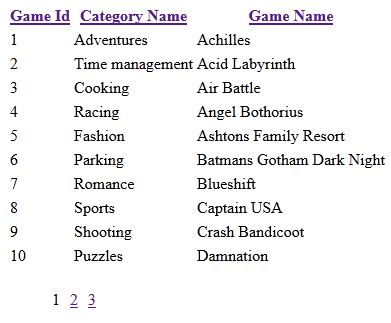 Then, you need to sorting tables based on column filed name. So you have to pass the field name in url. Similarly, you sort table values both ascending and descending. So you need to also pass order types in url. By default, table values displays in ascending. You can fixed order types and also field name. Now your headings should be like this. - table1.php is the name of file. 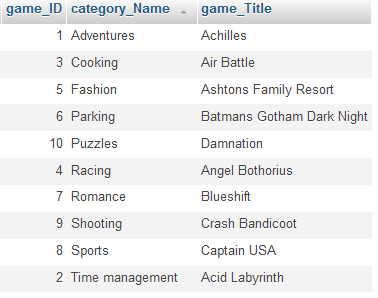 - game_ID, category_Name, game_Title are field names in mysql table. 3. Now you need get the values from url. where, you handle your statergies. ie, If sorting value is ascending, then you will sort table by descending. Likewise you'll sort table by ascending, if sort value is descending. Then you need to get column field values. 4. Then you write a query in which both order types and field name should be present. The mysql query should be like this. Finally you'll get PHP scripts for sorting table when you click the column filed name. Now you can sort tables as like as tables in mysql database.